On our drive home from Yamba we took the opportunity to explore a very special natural environment, just a short 45 minute drive from our camp on the Bellinger River inlet. 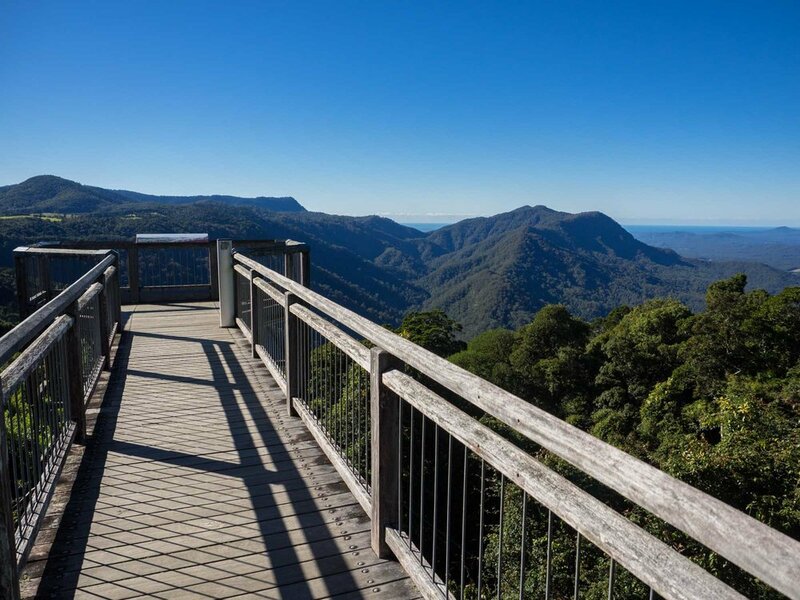 The Dorrigo National Park is part of the Gondwana Rainforests of Australia World Heritage reserves and contains an extensive area of subtropical rainforest. The Skywalk at the entrance provides a spectacular look over the park. The tops of the tallest trees can be seen from above, giving an overview of the highest habitat level within the forest, the canopy. Welcome Swallows were hunting for insects even higher up. We spent a few hours exploring a small section of the park, following the 'Lyrebird Link' track and the 'Walk with the Birds' boardwalk. The suggested walking time for this 0.8km return section is 30min to 1 hr. But experience has taught us that the best way to find birds is to walk very slowly, listening, peering into the shadows, and stopping frequently. The strongest impression I get on entering a rainforest is the darkness. The trees are so tall and the canopy so dense that little light penetrates to the forest floor. Plants tend to grow straight or twine around neighbours in their search for light. The low light levels also provides challenges for photographers! Slow shutter speeds and high ISO are the bane of Kerri's life. The forest floor is a dense layer of leaf litter. It may appear lifeless but it actually contains a rich community of organisms - small invertebrates, fungi and microbes - all breaking down the organic matter. These provide food for larger invertebrates – preyed upon in turn by birds, large and small. Shortly after starting the walk, we were very lucky to chance upon one of the more secretive ground feeders. The scratching sounds made by their feet as they turned over the leaf litter gave them away. A party of three or four Australian Logrunners, working closely together to uncover earthworms and other invertebrates. Kind of like tiny, beautiful chooks - but only about 20cm long. We came across a much larger ground feeder shortly thereafter - the Australian Brush-turkey. We tend to ignore these common and rather ugly 'chooks', but this time we noticed something rather intriguing. Like the Logrunners, the Brush-turkeys work as a team, with two or three birds scratching about in close proximity. And then we realised that the way to find the little birds is to follow the big ones! We saw a number of small birds taking advantage of the heavy lifting of the Brush-turkeys. 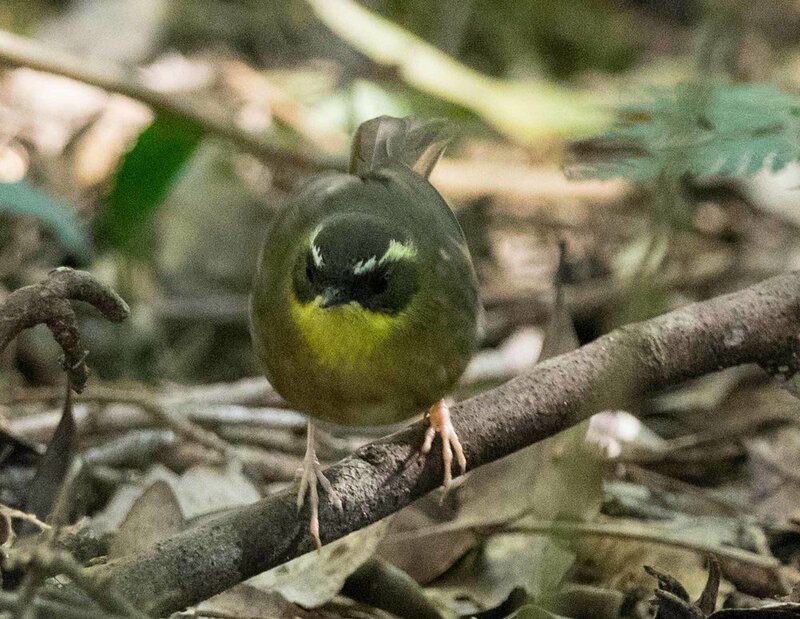 The Eastern Yellow Robin, the Pale-yellow Robin, the Yellow-throated Scrubwren and the White-browed Scrubwren all followed the big birds around, snatching insects and worms uncovered by the 'chooks'. We encountered several other hunters on the forest floor. I spotted the Noisy Pitta, but only briefly and from afar. This made us realise how lucky we had been to observe it at close range and at our leisure in the Iluka Littoral Rainforest. The ringing call of the Eastern Whipbird seems even louder in the rainforest than it does in our home dry sclerophyll forest. It moves rapidly between low bushes and the ground as it searches for insects and other prey. 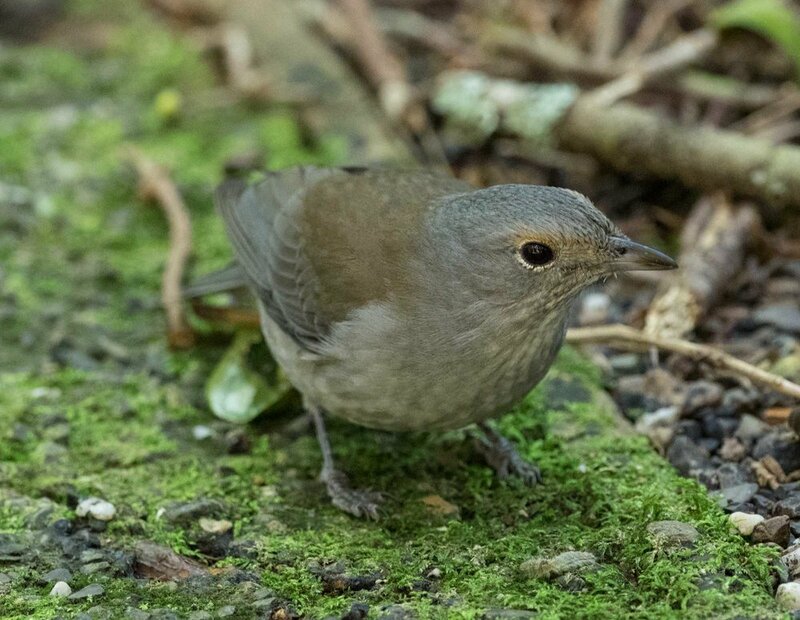 A Grey Shrike-thrush treated us to a very close view of its hunting prowess on the ground. Bird activity was not confined to the forest floor. We heard, but did not see the White-throated Treecreeper. We often see and hear it in our southern forest as it methodically ascends tree trunks, searching for insects on the bark. 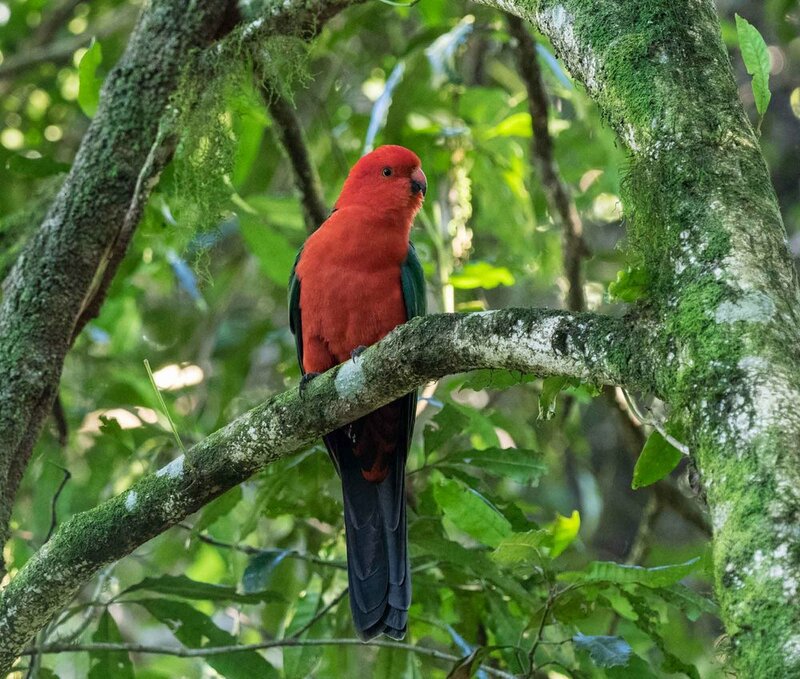 Two other familiar birds from home, which we did manage to sight in the rainforest are the Golden Whistler and the Australian King-Parrot. 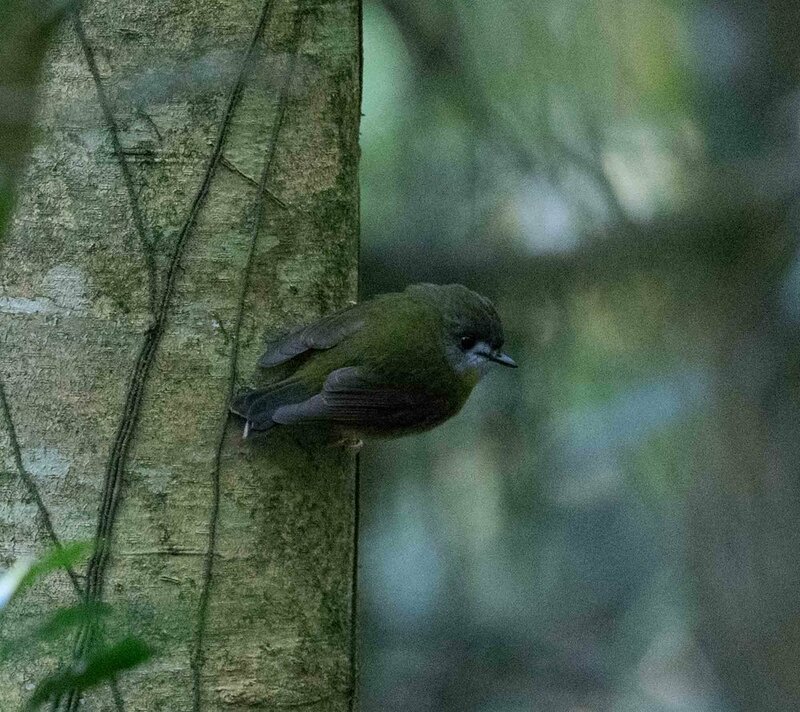 Both species were seen in middle levels of the forest, as was the Large-billed Scrubwren. 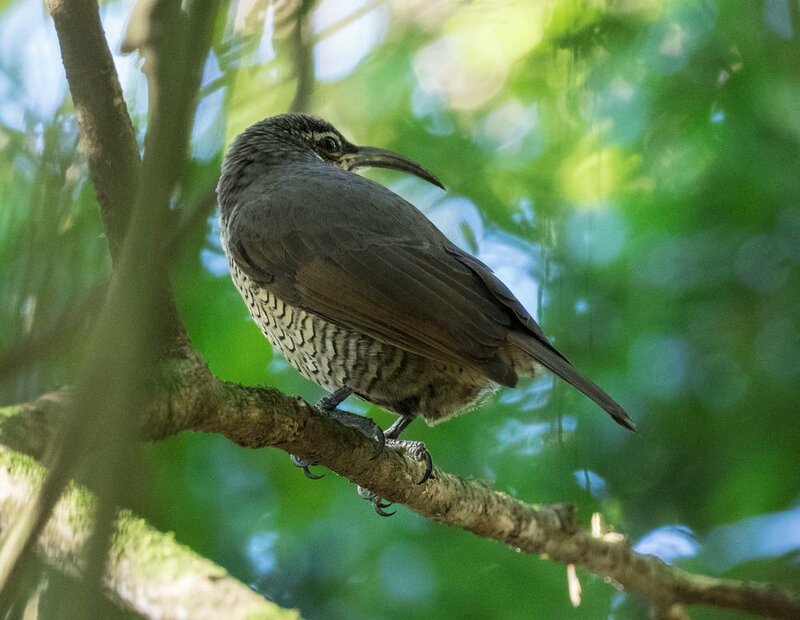 One of the Dorrigo birds we were very eager to see, but didn't really expect to find on this brief visit, was the Paradise Riflebird. We couldn't believe our luck when we came across a pair of these birds shortly after beginning our walk. We got only a brief glimpse of the spectacular black male but were treated to good views of the female. She used her long, curved bill to prise bark off narrow branches, searching for insects beneath. 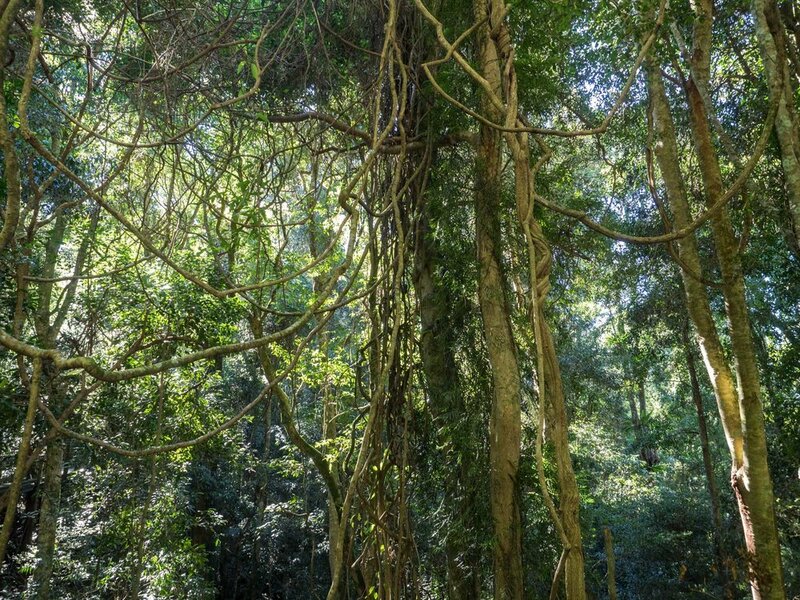 The rainforest trees are so tall that it is a major challenge observing birds in the canopy. But we did manage to sight one special bird - the Green Catbird - as it moved around high up in the roof of the forest. As we returned to the Skywalk to enjoy a final view of the rainforest from above, we came across another familiar species from home - the Pied Currawong. Not a bird we associate with rainforests, but some species are opportunistic generalists. After just three hours prowling this small patch of rainforest, we'd 'ticked' 20 species ... and four of them we had seen nowhere else during this trip (Paradise Riflebird, Yellow-throated Scrubwren, Australian Logrunner, Green Catbird). Not a bad haul!